Zuccotti Park, which has been ground zero for the Occupy Wall Street protest since mid-September, was cleared by police in riot gear early Tuesday morning. As NYPD officers carried out the raid, they turned away members of the media--occasionally by force, with several arrests ensuing . And like the protesters they were trying to cover, the journalists swept up in the raid have been crying foul. "I'm press!" Rosie Gray, a reporter for the Village Voice, claims she told a female police officer. Reporters such as Gray took to Twitter, using a #mediablackout hashtag to update their industry colleagues. At a press conference, New York Mayor Michael Bloomberg said police barred the media from covering the raid for their own protection, and "to prevent a situation from getting worse." "The First Amendment gives every New Yorker the right to speak out, but it does not give anyone the right to sleep in a park or otherwise take it over to the exclusion of others," Bloomberg said. "Nor does it permit anyone in our society to live outside the law." "Could #Bloomberg be a secret Occupy Wall Streeter?" Times columnist Nicholas Kristof wrote on Twitter. "He seems to have just revived the movement." According to Gothamist.com, the NYPD restricted airspace in Lower Manhattan to prevent local news helicopters from CBS and NBC from capturing video images of the raid. Police also used pepper spray on a "large number" of reporters. Reporters from NPR and the New York Times were among the 200 people whom police officers arrested during the initial raid. Julie Walker, a freelancer for NPR, was arrested "despite the fact that she was wearing an NYPD-issued press pass." Police held her for four hours before releasing her. Jared Maslin, a reporter for the New York Times's local East Village blog, said he was arrested as he tried to comply with the police orders to move away from the area. The "reporter was put onboard a police van with eight other arrestees, including two New School undergraduates, a photographer with Agence France-Presse, and city councilman Ydanis Rodriguez, all handcuffed behind their backs," the Times said. Rodriguez "had blood on his temple from what he said was an earlier confrontation with the police." 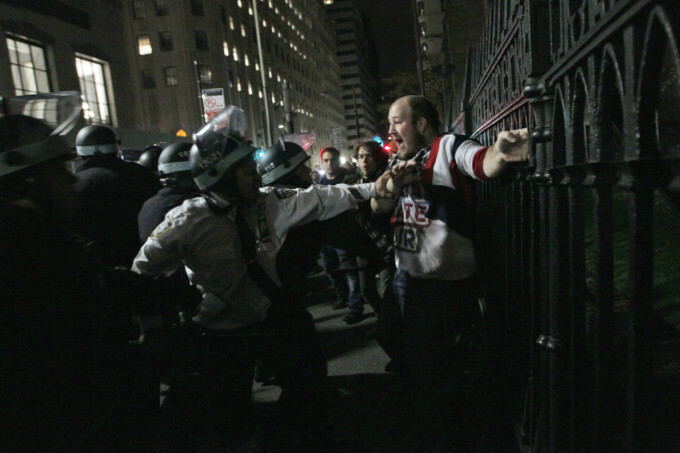 On Tuesday afternoon, police arrested at least four other journalists who were tracking OWS protestors as they tried to gather at another nearby park. Among that group of arrested reporters were journalists from the Daily News and the Associated Press, according to the Times.